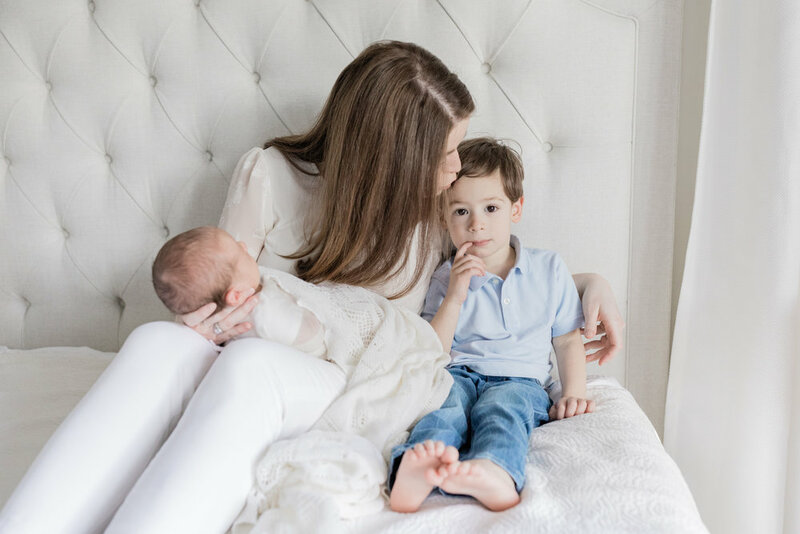 Where does Jenny Perry Photography do photo sessions? What time of day do you like to schedule sessions? What printer should I use to print my photos? Do you design announcements or holiday cards? I am a natural light photographer, which means that all photo sessions are on-location. I will work with you to choose the perfect location for your session. This could be an in-town studio (I work with two local natural light studios frequently - Park Studios, White Wall Woodstock Studio, and Heather Carraway Studio), in your home, your backyard, one of the several in-town parks I shoot at often, your favorite park, or anywhere that is meaningful to you! Typically newborn sessions are usually done in your home, but I also offer a studio newborn session. Any locations outside of the City of Atlanta incur an additional travel fee. The actual time depends on the time of year, but the best times for lighting for outdoor sessions are in the morning shortly after the sun rises and in the evening shortly before the sun sets. Indoor sessions are typically scheduled for mid to late-morning to maximize the available natural light. Mid-day is the least preferred time to take pictures outdoors because the light from the sun can create harsh shadows on faces. Of course, I always want my clients to look their best! I recommend contacting me a minimum of a month in advance of when you would like to have your session. I recommend two to three months in advance of your due date for newborn session scheduling. However, if I have availability I'm always happy to work with you with late notice. I always try to be as flexible as possible due to the very unpredictable schedule of your baby's arrival! October and November tend to book up quickly due to holiday cards, so schedule early! If you need your images for something special (such as holiday cards), please try to schedule your session three to four weeks ahead of when you will need the edited images. Great question! Each of my clients receive a Jenny Perry Photography Style Guide prior to their session. I also love to help style my families via email before our session if you’d like a more hands on approach. The most important thing is that you feel comfortable! Coordinating colors are most visually pleasing, but no need to wear matching outfits. I love light neutrals on top so that you are the focus, not your clothing. Try to avoid busy patterns or large logos. For more ideas, please check out my pinterest account by clicking here or on the pinterest logo at the bottom of the page. There are what to wear inspiration boards for newborn, family, and maternity sessions. My favorite stores for mama outfits are Anthropologie, Asos, Zara, Free People, Lulus, Morning Lavender, Pink Blush Maternity, Rolee, and Astr. My favorite stores for kiddos clothes are Gap, Zara, Jcrew crewcuts, Janie and Jack and (and so many more cute stores). My favorite stores for dad outfits are Jcrew, Gap, and Old Navy. I'm happy to source entire outfits for you, so just let me know and we will make sure you have that info with plenty of time to spare before your session. If you have questions, please feel free to ask! I will send all newborn clients an email prior to our scheduled date with tips to prepare your home and yourself for the session. As for lifestyle family sessions, just take a deep breath and relax before our session. I don't ask kiddos to say "cheese" or expect them to be perfect little angels for the entire session! I encourage natural interaction to garner genuine smiles, giggles, and love. So love on your sweet babies and let me guide you into getting the sweetest tender moments on camera with your family. Also, I definitely do suggest having a hidden (in the car) bribe for after our session that we can pull out only if necessary. But usually I am silly enough that we won't even need it! 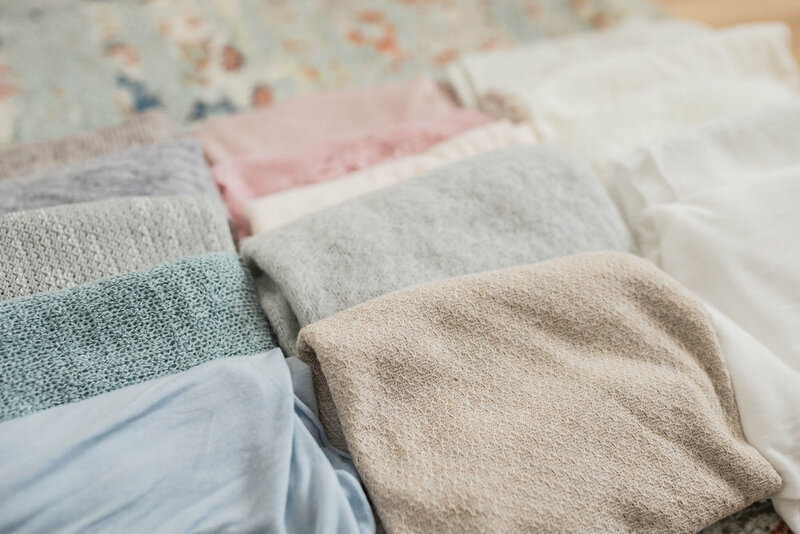 At newborn sessions I will always have several wrap and swaddle options as well as several draping blankets for photos. See above for examples. For family and milestone sessions I always encourage my clients to bring a favorite toy, child chair/stool, or heirloom blankets/quilts to include in the pictures. I will provide a neutral blanket for photos on the ground or for damp surfaces and, when necessary, a child sized rocker or chair. If you have any questions about what to bring, just ask! I'm happy to give guidance on the subject. All you really need for great photos is yourself, your loved ones, and a smile! I often post a few sneak peeks on my Instagram stories within two to three weeks of your session. You will receive your edited photos via a link to a personal gallery within two to four weeks of the session. This will be an online gallery available for viewing for two weeks, once posted. Please contact me for more information on the gallery and what is included in your session. If posting your photos online, please credit Jenny Perry Photography. You can print your photos with a professional printer right through your gallery or you may order fine art photo prints directly through me! The quality and color of these fine art photo prints will be leaps and bounds beyond shutterfly, the drug store, etc. In addition to this option, I offer a stunning selection of heirloom albums, folios, and folio albums. Please inquire for more details. Not exactly, BUT! I do have a Minted storefront where you will find my favorite simple designs for purchase directly from minted. Sometimes I may even be able to give you a special discount code, so just ask! Click here for my storefront. I'd greatly appreciate you purchasing though me and am happy to answer any design questions you have related to ordering your Minted cards.